Week four: the start of the bye week. For teams like the Eagles, it comes not a moment too soon as they wait for Donovan McNabb's ribs to heal. We certainly don't need a bye week. Last week was good for both of us -- Matt finished 12-4 while Cody came in with another 11-5 performance. Matt beat most ESPN analysts and Cody was right in line. Further props go to Matt for predicting the Lions win over the Redskins. Without further adieu, here's our week four picks. So the last few weeks have been pretty hectic around here. Between classes and work, I haven't had a whole lot of time to write anything to put on here other than NFL Picks. Matt is in much of the same situation. However, I do have some good news regarding our show. I have been going back and forth through e-mail with the program director at The Whale and as soon as I shadow another DJ, Matt and I should be all set to go live. Our timeslot is scheduled for Thursday nights at 10-11ish p.m. You can stream the show live on The Whale's Web site, or if you're in Allendale near campus you can listen to it on 1610 AM. My goal is to post a recording of each show up on here for those that may miss it live. We'll give you some more updates soon. I'm hoping that we will be on the air by next week, although I'm keeping my fingers crossed. On to week three we go. It would appear that we showed we are no experts in week two. Matt went 6-10 while Cody went 10-6. However, the best ESPN pick was 11-5, so we're no worse than those guys. As you may notice, Matt may be trying to redeem himself after a dismal week as he is predicting the first Lions win. The NFL always seems to produce athletes with big egos. Put those egos together with a little creativity and we get wonderful entertainment. Houston Texans cornerback Dunta Robinson has been fined $25,000 by his team for wearing cleats with the words "Pay me Rick" written on them during Sunday's game against the New York Jets. The Rick in question is Texans general manager Rick Smith, with whom Robinson is trying to secure a new contract. Robinson's stunt is the latest in a rather short, but glorious history of NFL escapades. Starting with Terrell Owens' infamous Sharpie celebration, fans have grown accustomed to expecting more high jinks every week. While the administrators of the "No Fun League" publicly say they disapprove of these activities, on the inside I bet they appreciate some of the publicity. Personally, I am a fan. While it does get annoying to listen to Chad Ochocinco's last name (especially now that Johnson is no longer on his jersey), his antics make me laugh. Honestly, how much worse is Ochocinco than seeing Shaq on his own reality show? What do you think of crazy celebrations and actions by players like Robinson? Week one has come and gone, so here are our picks for the second week of the NFL season. Surprise, neither of us went perfect in week one. Matt holds the worst pick of the week, as he had picked the Rams to knock off the Seahawks. We both came in at 11-5 on the week. The "experts" at ESPN were mostly right in line with us. In the week leading up to last Saturday's game between No. 1 Grand Valley and No. 16 Saginaw Valley, the GVSU campus was lit up with talks discussing how the football team would fare when matched against their rival. After grabbing a two-touchdown lead just a few minutes into the long-awaited game and thrashing SVSU by a final margin of 38-7, the Lakers proved a point. They have no rivals -- at least not in the Great Lakes Intercollegiate Athletic Conference. To think otherwise is just ignorant. If you do a search on Dictionary.com for the word rivalry, there is a word that stands out in the definition: competition. GVSU has no competition in the GLIAC. They have posted a 75-3 record in their last 78 GLIAC games, and have won 45 straight regular season games dating back to 2004. Saturday's game posted an official attendance of 16,647 people, far above previous records for GVSU and a new record for the GLIAC. The attendance figures had a lot to do with hype. Students were lined up six or more deep in standing room only on the south side of the field. They expected to see a hard-fought game. Instead, they saw a massacre. Let's think twice before we say GVSU has rivals, shall we? 10. There is such thing as unsportsmanlike conduct in tennis. Defending U.S. Open champion Serena Williams was called for this after arguing with a line judge over a foot fault. Her profanity-laced tirade cost her a point -- match point that went to eventual Open champion Kim Clijsters. 9. The Detroit Lions defense is as bad as last year, maybe worse. Ok, ok. I know that the Lions were playing possibly the highest powered offense in the NFL in the New Orleans Saints, but to give up a Saints franchise record six touchdown passes is just inexcusable. Oh and by the way, New Orleans were playing without starting running back Pierre Thomas which I firmly believe could have made things worse for the Lions. Still, they made backup Mike Bell think he was back in Denver again. 8. There is nothing wrong with Tiger Woods. The world's number one golfer has not won a major championship this year and that had some questioning his abilities. Well, the reality is that he has a PGA Tour-leading eight victories this year, and shot a ridiculous 62 in the third round of the BMW Championship at Cog Hill to get to 16 under par. He could have decided to take Sunday off and still walked away as the winner. The Detroit Tigers have been a team that does not look like a division leader and certainly not one that looks ready for post season baseball. They finally snatched a win, but only after dropping five straight games. The Tigers have played their last ten games at .500 but the White Sox and Twins don't seem to want to win it either. Chicago and Minnesota played their last ten at 6-4 and 4-6, respectively. Another cause for concern is the Tigers have a run differential of only +15. The next closest division leader is the St. Louis Cardinals at +85. I smell trouble rolling into the postseason. 6. Dwayne Wade is not ready to spend his career with the Heat. Flash has decided not to exercise his option to sign for the 2010-2011, which means he will become an unrestricted free agent at the end of this upcoming season. Wade, who had career highs in points, assists, steals, blocks and three-pointers last year, led a disappointing Miami team to a 43-39 record, which was still playoff worthy in the weak Eastern Conference. Still, the days of a championship competing team with Shaq are long gone, and with the most promising free agent season of NBA history looming, he will find a better deal somewhere else with a better team. 5. Forget Favre, the Vikings are still A.P. 's team. The Minnesota Vikings and Brett Favre saga may have been one of the biggest, most-talked about stories in NFL history. With all the excitement of Brett giving the Vikings a legitimate quarterback, some forgot about MVP-caliber running back Adrian Peterson. A.P. calmly showed Sunday that it still is his team, ripping the Browns for 180 yards and three touchdowns. This included one of the more impressive runs of Adrian's career, breaking four tackles and highlight-reeling his way for a 64-yard touchdown dash. Favre had 110 yards passing, one touchdown, and most importantly, no interceptions. With Peterson behind him, that is all he needs to do week-in and week-out. 4. Michigan football is back. Maybe. After losing game after game to inferior opponents last season, the University of Michigan was the joke of college football. This year is a little different story with a win over Western Michigan and a more impressive come from behind victory over No. 18 Notre Dame. I'm not totally sold on Michigan football just yet, but I will say freshman quarterback Tate Forcier was awfully impressive. 3. Throwback jerseys for NFL teams are cool; throwback jerseys for referees are not. While I write this, the Buffalo Bills are currently playing the New England Patriots on Monday Night Football. Both are sporting their retro jerseys, but apparantly that wasn't enough for the NFL. Now the referees are sporting orange-ish, candy cane-looking uniforms. It wasn't a good idea, NFL. It just wasn't. 2. The Cowboys will actually be better without Terrell Owens. Terrell Owens is a number one receiver on most NFL teams, as he was last year with the Dallas Cowboys. However, without his "me first" attitude, Tony Romo is free to spread around the ball to Roy Williams, Patrick Crayton, and Mile Austin. As a result, Romo threw for a career record 353 yards including one touchdown to each of those receivers, the shortest of which was 42 yards. Tony did all of this while only giving his favorite target, tight end Jason Witten, only five catches for 71 yards. The Cowboys are again dangerous. 1. Try as I might, I do not know everything. I got a lot of the start'em, sit'ems right for fantasy football, but I take responsibility for Matt Schaub and Owen Daniels. My bad fantasy owners. My bad. The Cardinals proved to me that they do not have this division locked up and it's not even close. Carolina Panthers worry me about my pick for them to win the NFC South. Four interceptions Jake Delhomme? Really? If the Lions play defense like this all season, then they will not win a game. The Steelers will actually win the division, not the Ravens. The Ravens showed some offensive prowess, but if there going to give up 24 points to a Chiefs team without Matt Cassel, no way they are upending the champs. For $3.1 million dollars, Allen Iverson is certainly a bargain for the Memphis Grizzlies. But, as the Detroit Pistons found out last season, AI is definitely not the AI of old. Pistons president Joe Dumars' swap of Chauncey Billups for the baggage-laden Iverson last fall had as much to do with salary cap as performance. But even Dumars could not have expected Iverson's stats to flat line like they did. Iverson averaged only 17.5 points per game last season, the lowest average of his career, and a far cry from the 33 he averaged during the 2005-06 season in Philadelphia. At his introductory press conference Thursday, Iverson said the upcoming season will be "so personal." "It's basically going to be my rookie season again," he told media. "It hurts, but I turn the TV on, I read the paper, I listen to some of the things people say about me having the season that I had last year and me losing a step, things like that. They're trying to put me in a rocking chair already." Translation: Iverson has to prove he can still fill stat sheets with a terrible team so he can get a better contract next year with a better team. The bottom line is Iverson has never been well liked. He's lazy ("We're talking about practice! "), injury prone and is certainly not a team player. All of that, plus his declining stats made him unattractive to just about every team in the league this offseason. 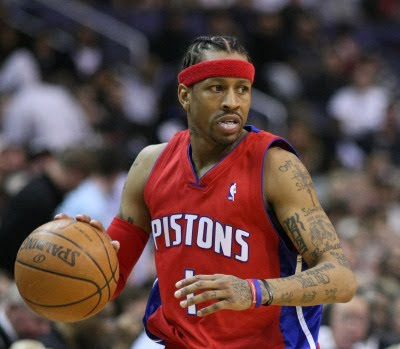 Iverson will flourish in Memphis. He will be the focal point of the offense and get his 25 points per game. But as a team, the Grizzlies will be no better than in years past. At the most, the acquisition of Iverson will sell some jerseys and put some fans in the stands. For a struggling team like Memphis, that might not be so bad. Need help making those last minute decisions for your fantasy team? Have no fear, Sunny's fantasy help is here. CEDRIC BENSON: Week one against the Broncos. Look for the Bengals to be running a lot in the second half. MATT RYAN: Matt's going to want to establish his connection with Roddy White early in the season. Expect the same for new tight end Tony Gonzalez. RAY RICE: First game as the Raven's official starter. Yes, there will be a time share, but then again the Ravens are playing the Chiefs. ALL OF YOUR SAINTS: Seriously, if you have any, put them in your line-up. That goes for Henderson and Moore as well. Playing the Lions at home, I'd start the Saints offensive line if I could. DeSEAN JACKSON: He will have a good day, breaking at least one big one for a score. VINCENT JACKSON AND CHRIS CHAMBERS: Whether it makes sense or not, San Diego is an air-it-out team now, and they're playing a Raiders team that will be too concerned with LaDainian Tomlinson and Antonio Gates. ANTONIO GATES: I said the Raiders would be concerned with him, not that they would stop him. OWEN DANIELS: Quarterback Matt Schaub seems to like this guy, and he compliments the three headed monster of Schaub, halfback Steve Slaton and receiver Andre Johnson well. ANY TITAN OR STEELER NOT NAMED CHRIS JOHNSON: Go ahead and start LenDale too if he's a flex play or a third running back, but find something better if you can. This game will just not have the offensive numbers to be productive. 10-7 anyone? RYAN GRANT: The Packers are going to win, but not because Grant rushes for over a hundred yards. CLINTON PORTIS: I'm scared to say it, but last year Portis only managed 106 rushing yards in the two games that he played against the Giants. LARRY JOHNSON: The times of Larry being a stud are far behind him. That and with Matt Cassel injured the Ravens will be filling the box with nine defenders a lot. I'll give the win to the Ravens. SANTANA MOSS: Once again Moss is a Redskin up against the Giants defense with Jason Campbell running the team. BRAYLON EDWARDS: Sorry Braylon, you're going to have to play your way back into my lineup. JAY CUTLER: Not yet. Let's just see what happens. Here is my AFC division previews to go along with the NFC's which can be found here. The season starts tomorrow! Bold Prediction: Lee Evans will out gain Terrell Owens in total yardage. The AFC East was a division of surprises last year with Brett Favre leading the Jets to an elite status, then back down to mediocrity in one short season, and the Dolphins changed the way offense is played with their "Wildcat" formation. The Pats will run away with the division even with a depleted defense. You just can't teach a Tom Brady to Randy Moss type connection. The Dolphins overachieved last year and this year they will once again be the Dolphins of old. NFL defenses are ready for the Wildcat offense. The Jets will be a team to watch with rookie quarterback Mark Sanchez starting for them. Terrell Owens is a big name addition to the Bills, but he will most likely be there for only a year and will play like it. Bold Prediction: No matter what Chad Ochocinco says, the Bengals will not win twelve games. With returning Super Bowl champion Pittsburgh Steelers and AFC finalist Balitmore Ravens, this division is always tougher than advertised. Pittsburgh will not repeat as Super Bowl champions nor as divisional winners. They have a talented defense but as of yet, I'm still not sold on their offense. Baltimore is ready to take the leap into the elite team of this division with a scoring defense and a better than talked about offense. The only thing that could hold them back is a mediocre receiving core. Cincinnati will be a better team with a healthy Carson Palmer, but has not surrounded him with enough talent for him to do anything with. Cleveland is giving quarterback Brady Quinn the starting nod, which is what fans have been begging for for over a year. It'll be an up and down season with a less than average result. P.S. I wonder if Braylon Edwards will show up this year? The AFC South has two legitimate deep playoff teams in the Colts and the Titans. The only reason I don't see the Colts grabbing the division is because it is Peyton Manning's first season without Tony Dungy running the show. Matt Schaub, Steve Slaton and Andre Johnson lead the Houston Texans as one of the best offensive trios in the game. They will put up points, but Mario Williams can't play every defensive position. In Jacksonville, Maurice Jones-Drew is starting his first year as the feature back and quarterback David Garrard will have a pretty decent season. The Jaguars are always a competitive team, but they don't have the talent to get them over the hump. Bold Prediction: Al Davis makes at least one attempt to secure Olympic sprinter Usain Bolt as a receiver. The AFC West is going to be the Phillip Rivers playground. There is really no threat to the Chargers and they shouldn't have to make a theatrical race as they did last year. San Diego easily has the best offense and defense in the division, and I could go on and on about why they are the best in the AFC West, but really do I need to? The Broncos have a decent receiving core in Brandon Marshall and Eddie Royal, but sadly new quarterback Kyle Orton will not get them the ball near enough. Kansas City has last year's surprise quarterback Matt Cassel, who may not even make the Chiefs first start. Dwayne Bowe is the only notable name on this team now that Tony Gonzalez is gone. The Oakland Raiders are bad -- enough said. Darren McFadden might put up decent numbers for an otherwise helpless football franchise. I had to post this just because I'm still in awe. My best friend asked if I would help draft her fantasy team. As it turns out she is playing in a six-team league, and as the draft progressed, it become apparent the people she is playing with know almost nothing about fantasy football. Yes, Steven Jackson fell to the 11th round and Brian Westbrook fell to the seventh (!). We had to draft defense and kickers early because for whatever reason her league-mates started drafted those in about the fourth round. I'm envious of this team. If she doesn't win her league, then I don't know what will. Bold Prediction: The Lions do not go 0-16. In one short offseason, the NFC North has suddenly become a division where quarterbacks are to be feared rather than joked about. With the acquisitions of Jay Cutler and Brett Favre by the Bears and Vikings, respectively, and Aaron Rodgers with a season under his belt as a starter in Green Bay, the black-and-blue division will turn to the air to put up a considerable amount of points. The only question mark that remains at quarterback is Detroit Lions' rookie Matthew Stafford. Stafford will be at the helm in week one for the Lions, head coach Jim Schwartz said Monday. Should Stafford falter, the Lions have former Viking Daunte Culpepper waiting in the wings. The Vikings have too much fire power and too talented of a defense to not win this division, but the Packers will be fighting for a wild card spot with if Greg Jennings can be as productive this year and the defense can play well enough to scrape together nine wins. Bold Prediction: Michael Vick catches more touchdowns than rookie receiver Jeremy Maclin. The NFC East is a consistently tough division to predict winners and this year is no exception. The division will produce no stellar records after the teams beat up on each other and thus wild card berths will be tough to come by. With a healthy Brian Westbrook the Eagles should be able to narrowly pull out the divisional title. The Cowboys have the best quarterback in the division in Tony Romo, but he can only throw to tight end Jason Witten so many times. Washington will be competitive, but they pose no serious threat as long as Jason Campbell is quarterbacking the Redskins. Finally, the Giants will start their fall from grace with no real receiving core to speak of. Their defense will win some games, but just not enough. Bold Prediction: Mike Singletary gives backup quarterback Alex Smith the reigns by week five. The NFC West was a one team show last year and will continue to be this year. With the best receiving duo in the game in Larry Fitzgerald and Anquan Boldin, quarterback Kurt Warner will have another great year at the tail end of his career. Look for this division to be wrapped up by week 12. The only surprise this season will be the increased production in Seattle's offense. A healthy Matt Hasselbeck has a much improved receiving core to work with, so T.J. Houshmanzadeh, Nate Burleson and Deion Branch will put up some respectable numbers. Steven Jackson will have a 1,000 yard season but, at the end of the day, the Rams just do not have the talent to compete. Singletary's 49ers will produce two wins this year that will be considered a big upset, but sadly those two wins will be part of a six-win season. Bold Prediction: Drew Brees braeks Dan Marino's record for passing yards in a season. Besides the Buccaneers, the NFC South is loaded with offensive talent. The Panthers will win the division but not by more than 2 games. The punch of a DeAngelo Williams-Jonathan Stewart backfield with Steve Smith as a deep receiving threat will be sufficient to win the title. Look for Matt Ryan to have a breakout season with new weapon Tony Gonzalez as the Falcons will have to rely less on stud running back Michael Turner. In New Orleans, Drew Brees will again throw for 5,000 yards and people will be surprised by the running back tandem of Reggie Bush and Pierre Thomas. If the Saints' defense can ever stop an opponent they will be an extremely dangerous team. The Buccanears will again have a respectable defense and a decent receiving core headed by Antonio Bryant, but lack any real fire power to compete with the rest of the division. Hi! Welcome to the official blog of The Sunny and C Show, a talk radio show devoted to sports. The show is hosted by Grand Valley State University students Matt "Sunny" Sundberg and Cody Eding. The pair's engaging and energetic style make for a very interesting hour (or two) of local and national sports talk. Sunny and C will make their debut in the fall of 2009 on GVSU's student-run radio station WCKS The Whale.